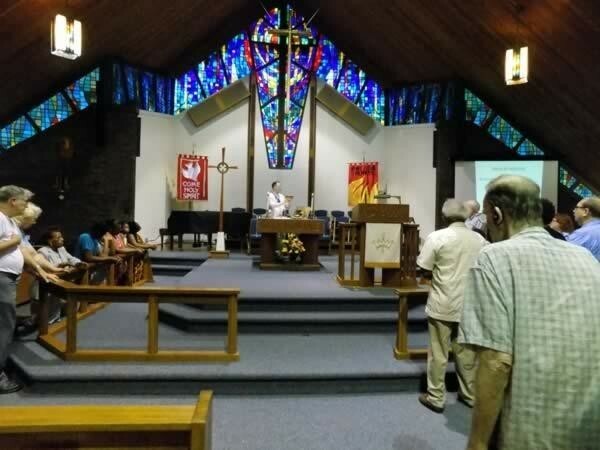 Park Forest, IL-(ENEWSPF)- Pastor Chris Wogaman began his tenure at Trinity Lutheran Church in February. 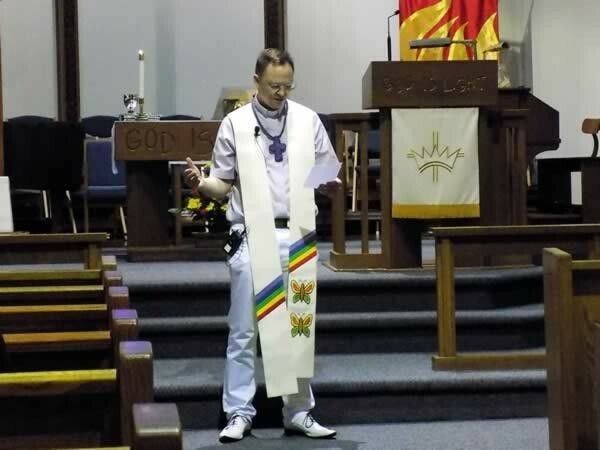 At 42-years-old, the spirited, openly gay pastor is intent on getting to know Park Forest, even as his relationship continues to grow with members of his congregation. Raised Methodist, then an atheist for a while, he returns to a theme that “All are welcome,” throughout this interview. When he was an atheist, it was the availability of a piano in a local Lutheran Church that first brought him inside. As a pastor, he affirms that all are welcome, Christian, non-Christian, atheist, people of all races, all ethnicities. As he puts it, his goal is not to knock on doors and tell people about Jesus. Rather, he endeavors to be Jesus, and that means openness to all. eNews Park Forest: So, tell me about yourself. Pastor Chris: Well where is a good place to start? eNews Park Forest: When did you start at Trinity Lutheran? Pastor Chris: I started at Trinity on the 15th of February. So, I have been there just about four months and I am their solo full-time pastor. In the past, they have had more than one but for now I am the one they have. We have a membership of maybe 110. Pastor Chris: No individual members. We have two services on a Sunday morning. We have a traditional service that, during the summer, is meeting at 9:30, and then at 11 AM, a contemporary service. Generally during the year, we have got an adult education hour in between. eNews Park Forest: How would you describe the congregation? Pastor Chris: It is mostly older people, and I think, with many churches, it used to be much larger than it is. They are lovely people. I went and visited three of our members this afternoon and the membership has been there for quite a while. So, we have people who are– one of my members is still a last remaining charter member who still attends. So, she has been there since 1949 and others were there since the ’50s and ’60s. They are really lovely people. I would say it is mainly Caucasian, we have some African-American members. We have got a family from Liberia and we have a woman from Sierra Leone who is one of our very faithful members. I know one of the things that we are really interested in doing over at Trinity Lutheran is to make more inroads in to the community and with the community that we have I would say reflects the community as it was in the 1950s and ’60s and ’70s. I am very interested in getting out and seeing who we meet for the people of Park Forest and the area today. eNews Park Forest: What kind of inroads are you talking about? Pastor Chris: Well, that is kind of the very basic question to how do you meet people or how do people meet or how do people form community. It was very different in the 1950s and ’60s than it is today and a question a lot of churches are asking is it used to be people would pick a church and it would usually be based upon what they grew up as. I grew up as a Methodist myself but I had several years where I would have called myself an atheist and this is kind of the path that a lot of younger people take nowadays is not necessarily in to the ministry but out of the faith that they were raised with. eNews Park Forest: So how old are you? You are not one of the gray-haired. Pastor Chris: Well, I have got a few growing, I am 42. So, I tend to look younger, people tend to think I am younger than I am. One of the interesting parts of my story is that I waited for 10 years for my first call. So, Trinity is my first call as a pastor. eNews Park Forest: What do you mean by first call? Pastor Chris: Which tradition do you come-? eNews Park Forest: I’m Catholic. Pastor Chris: With the Catholics that I have known you have your seminary experience they usually spend some time learning philosophy and theology and then they usually teach and maybe have a year where they are kind of getting ready. I had my internship here back in 2005-2006 and that was at Trinity Lutheran Church in Manhattan in New York City. Pastor Chris: Five. 2006. Then I did a Lutheran. I did my theological degree at Yale University in Newhaven, Connecticut and I was also a student of the Institute of Sacred Music at Yale. Pastor Chris: It is an independent school at Yale University that brings together people that are studying to be church musicians as well as people who are studying to be pastors and there are some that are doing art or literature and religion. So, it is an interesting creative community. eNews Park Forest: So, what was your focus in theology? Pastor Chris: I was pretty much just a generalist and, you know, you do course pretty much with any seminary you do your church history, and your worship, and pastoral care, Bible, Old Testament, New Testament. I have always been interested in the Greek language because my undergraduate major– I went to Lawrence University in Appleton Wisconsin. It is a liberal arts college of all strictly undergraduate, and I studied music, and political philosophy, and philosophy, and classics. I did some learning in Greek. eNews Park Forest: Political philosophy and? Pastor Chris: Regular philosophy. I was a double major in philosophy and classics until my senior year, but I also had a lot of courses in music theory. I am also a pianist, so I play classical piano and I studied quite a bit of music theory also undergraduate. eNews Park Forest: What year did you graduate from Lawrence? Pastor Chris: 1997 with a Bachelor of Arts in classics. Then in 2005 I graduated with my Masters of Divinity from Yale Divinity School. I also did a year of Lutheran seminary at the Pacific Lutheran Theological Seminary, and that is in Berkeley, California. eNews Park Forest: What do you like so far about your work here in Park Forest at Trinity? Pastor Chris: I very much enjoy visiting our members, I have been doing a fair amount of that and preparing for worship. So, I really enjoy leading worship. You had asked earlier about what I had focused on, and I focused on liturgy and worship when I was at Yale and my interest was both in writing liturgy as well as in thinking about the emotional aspects of liturgy and what emotions people bring, and express through liturgy and worship, what they bring to it and the extent to which liturgy might either unintentionally or intentionally encourage certain feelings or allow them to be expressed. I did some work on the Psalms for example and the Psalms of lament and how that gives a person opportunity to both express some feelings that might not be easily expressed in other places. eNews Park Forest: Or feelings that– statements that some might consider blasphemous. Pastor Chris: Well, that could very well be. There are feelings that are generally not comfortable for people in churches and that has been one of my interests is authenticity. As myself, I am an openly gay man and that was what led to 10 years of a wait for a parish. I didn’t get any interviews for call for the first five years that I was waiting. eNews Park Forest: No kidding? Pastor Chris: No kidding. I stuck out the progress and I was in conversation with probably about 25 different synods out of the 65 in the ELCA. The folks of the Metro Chicago were the ones that were the most faithful in working with me to find a parish. So, I would say I had interviewed with about eight congregations in the Metro Chicago and, Park Forest, interestingly, is the furthest south in the Metro Chicago synod. I have been told by others that the south suburbs tend to feel neglected when it comes compared to the city and to the northern suburbs. eNews Park Forest: We have been seeing that [neglect] for years, whether it is economic red lining whether it is– whatever it is. But south of I-80, it is like we are off the map. Pastor Chris: And I have a heart for people who feel marginalized. eNews Park Forest: I think also in the gay community it is much the same. Everything is up in the city and what is in the city isn’t necessarily what people need. Pastor Chris: I am interested in making inroads to whatever gay, lesbian, bisexual, transgender community there may be here and it doesn’t seem like there is an awful lot. As far as I know, I don’t know at least in the few suburbs around here if there are other congregations that are openly welcoming. eNews Park Forest: I think the Unitarians. Pastor Chris: The Unitarians are for sure. eNews Park Forest: Definitely down the street. Also, Calvary United Protestant Church, I believe. 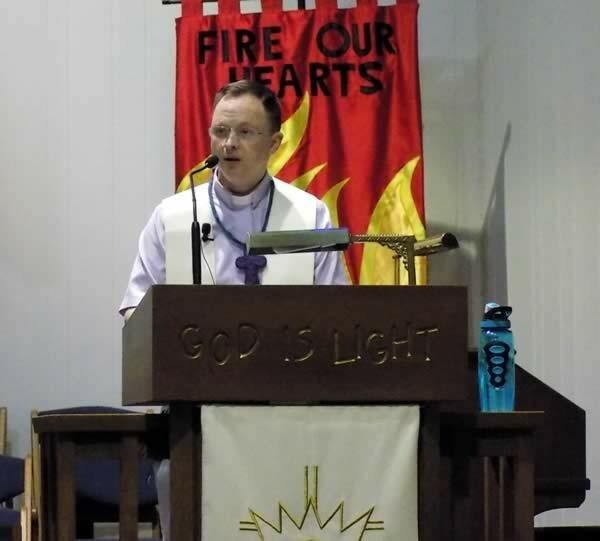 Pastor Chris: I enjoy relating to a wide range of people from a wide range of backgrounds of every race and creed, and say people don’t even have to be Christians to come to the Trinity Lutheran Church. Trinity is open for any who are seeking community. It is a project for the 21st century, really. The conversation has often been how do we get people to go to church, but, for me, the conversation is how do people make community? How do people form it? How does it come together? Because it used to be very different in how it formed and came together and I don’t know that anybody really knows the answer to those questions, but there is no less need today, whether it be religious community, or even just secular community. eNews Park Forest: Help me with some of the– ELCA is the? Pastor Chris: Evangelical Lutheran Church in America. eNews Park Forest: So that is the large conference? Pastor Chris: That is the denomination and the synod is like the diocese, or the archdiocese. The synod is the Metropolitan Chicago synod. When you are getting to be a pastor, you have to work through the synod and they give your name to the congregational committee, sort of interviewing pastoral candidates, and usually they have five or six candidates per church that are selected, and then that is how you kind of get in. eNews Park Forest: So, do you live at the Parish? Pastor Chris: I currently live in Homewood. They had a parsonage when they built the church back in the early ’50s, but that became the offices of the church at some point. So, I am residing in Homewood. eNews Park Forest: So, you were ordained April 1st? Pastor Chris: I was ordained on April 1st of this year. eNews Park Forest: How do you find the members of the congregation? If they hired you, they are a progressive bunch. Pastor Chris: Yes, I would say they are mostly a progressive bunch. We have some Trump voters, as I am told, and I would say the larger bent is progressive. Iit is a healthy congregation. They way that people care for each other is something that I think is very special, and they also care for me as their pastor, and they ask you questions about how you are taking care of yourself. Just this afternoon I visited one of the members who has had to be at home for a couple of weeks, and, just as I was getting there one of the other members was leaving. So, they look after each other outside of the church. There are social circles, and family circles, and it is a really high level of care that I feel that they have for each other. eNews Park Forest: How is your youth involvement? Pastor Chris: We really don’t have many youth and I know this is a challenge. We are going to be having a week of vacation bible school from the 7th to 11th of August, and I believe it is going to be from 5:30 until 8:30 in the evening. It is going to start out with some dinner and we are hosting that with Redeeming Grace Church as well as God’s Grace Community Church. Those churches are renting space from us. So, those communities also worship at our facility. We have got a program that is called the Mighty Fortress. We have got the 500th anniversary of The Reformation is being observed in October of this year. 1517 that was when he nailed, boom boom boom. eNews Park Forest: Nobody showed for his great debate. eNews Park Forest: Yes. Nobody showed and it would have gone down at that point except for 50 years prior with the invention of the printing press, his students took the theses and they made thousands of copies distributed them all over Germany, and that was it. So, the debate itself kind of passed with a whisper, barely a whisper. But man, it caught on like fire after that. Pastor Chris: It is like a movement, and you have a flame here and a flame there and you have got a pounding of theses here, and you have got a raising of rebellion there, and you have the Anabaptist Reformation, and you had your Martin Luther, and Zwingli, and you had John Calvin. eNews Park Forest: Zwingli, Ulrich Zwingli. That’s a name I haven’t thought of in a long time. Pastor Chris: They all have their thing, and those are just the names that we tend to float to the top. Then there were people before Luther, one who was put to death in a fire. They were not very nice to their alternative thinker back then. eNews Park Forest: No not at all. Pastor Chris: We have cut that out at Trinity, we haven’t been known to light anybody up or anything like that. That is one of our areas of welcome I would say. Pastor Chris: That is one of the exciting things when I was fixing to come down here investigating the city and its history was way in the forefront of integration. Pastor Chris: That could be a project that could involve that area of community building, because we still help people and we have got people in my congregation who I think were into that back in the ’50s, and they are not going to live forever. I know there have probably been video oral histories and written, what was that like at that time and especially in a part of the country where institutional racism was especially ugly. The town itself being openly welcoming. Where is it today, and where does it need to go? eNews Park Forest: In 1985 [Park Forest] passed a non-discrimination ordinance for housing for LGBT. Pastor Chris: In the ’80s? eNews Park Forest: In the ’80s, and it apparently passed without any public objections. It just came up at the board meeting, there was a discussion, and it passed, and it was part of the community ever since then. I look at it as, I can’t expect people to accept me as their pastor if I am hiding this area of my life, and there was a time for so long where it was nobody’s business, but it is people’s business, and that is partially because we don’t have those rights we don’t have those protections and there are people who are still getting expelled from their families and from their homes and their jobs. eNews Park Forest: Young people. Pastor Chris: When I was on internship, I helped to found–it became a shelter for LGBTQ youth– and it began as my internship project and we were taking on at that time the only emergency shelter for that population during the winter. And there were a few people who were going around trying to solicit churches to help with that. We were one of the first to say that we would, and so the original plan was to do it for a week, and the week worked out so well that we did three weeks. And one of the congregational members who was a social worker picked it up, and we got some extra funding. We got a $10,000 grant from the Family Foundation in Minnesota that one of our members was connected to. That shelter launched as a seven day a week 365 day a year shelter on June 12th, 2006.
eNews Park Forest: That is in Manhattan? Pastor Chris: That is in Manhattan on West 100th Street. Trinity Place Shelter. None of us had any experience with starting shelters. But the pastor there is Heidi Neumark, and she is a very highly regarded urban minister She has got a heart for that community and she knows that there are people who get kicked out of their homes, especially transgender youth. So, most of the youth we had coming in while I was there were trans youth, and they were not safe at other youth shelters even in Manhattan. So that is a population that has a need everywhere. 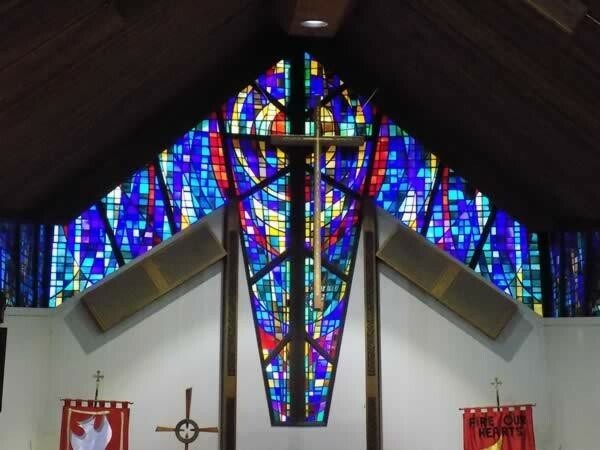 eNews Park Forest: So, what would you like to see happen at Trinity Lutheran? What are some of the things you would like to– Your five-year plan, your 10-year plan? Pastor Chris: What I would love to do is find a way to meet the people who live within a hundred feet of our church and the question is do you go and knock on doors, do you show up at town meetings, do you just walk the streets in your collar? What do you do? Because those hundred feet or two hundred feet they can feel like a hundred or two hundred miles. I want people to know that there is a community at Trinity Lutheran that cares for them, whether they come to church or not, whether they are Lutherans or not, whether they are Christians or not. But developing those relationships, that is number one, and I don’t even know where a person necessarily starts. Pastor Raymond Legania is on the bishop’s staff in Chicago. He preached at my installation service on May 13th. Pastor Legania said, “Do not go walking door-to-door and knock on people’s doors to tell them about Jesus” He said it four or five times. He said, “Do not go out and knock on people’s doors to tell them about Jesus. Go out and make relationships with people and be Jesus for them.” And, I think, as Christians, that is something we do for each other. I would never want to be that pastor who thinks that he is Jesus. Because, we are all human beings and fallible, and we all are in need of turning daily forgiveness and repentence. That goes for pastors and people and everybody. It can be a wonderful rhythm of life when you can get in to it, although it is a challenge. But how do you make those relationships, those connections? Like I say, I am not looking for people, I don’t want to tell them not to come and be members of Trinity Lutheran Church, but they don’t have to feel obligated to do that. eNews Park Forest: So, you are saying all are welcome. Pastor Chris: Christian, non-Christian, young and old, black and white. I would say it’s people who are looking for a community of caring people. And I can’t say everybody is always going to be caring in the way that people need them to be caring. I can’t say we are anything less than human, or anything more than human. Pastor Chris: Well part of it for me is just getting out. I have been spending most of my time getting to know the people at Trinity, and people tell me I have been doing a pretty good job of that. I think it is just like any growth that you start expanding. 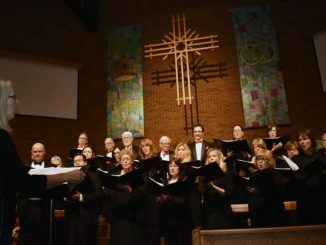 Outside of the church aisle I was a singer with the Grand Prairie Singers in their last concert. It was an all Hebrew concert. I sang with the Twin Cities Gay Men’s Chorus for seven seasons. I really enjoyed the chorus and kind of miss that when I came down here. 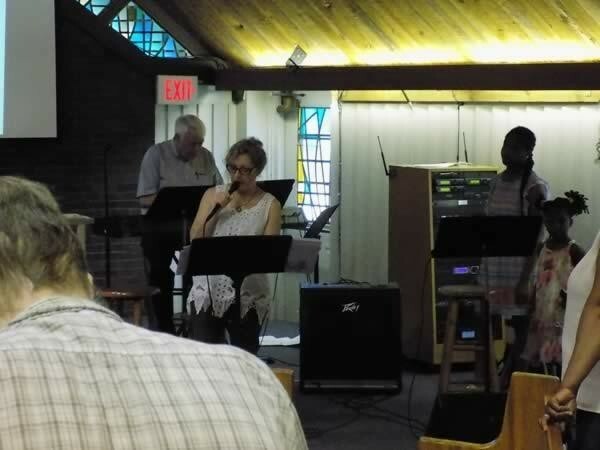 Two of the couples in my congregation are singers in that chorus, and they were encouraging me to come out, so I said, “Okay I will check out a rehearsal.” I did, and I just kept coming and then we had a concert. That was a lot of fun. I am interested in the inter-faith conversations as well that might take place. I know that there are the three synagogues that have been in conversation about their futures in the immediate area. Pastor Chris: There aren’t a lot of communities [welcoming, like Park Forest], there really aren’t. I know a lot of people have lived here for many, many years, and, sometimes it’s easy to forget that. Then again, I know for myself, and I know for anybody else, especially as white people, we have areas of unexamined privilege and unexamined race prejudice, that sometimes the more liberal you get, the harder it is to identify or to admit to those. eNews Park Forest: Then you bring out privilege. Pastor Chris: Well, the loader you talk against being something, usually the harder of an issue it is. Who wants to say, “Hi I’m a racist.”It’s like if that is the case then you can deal with it. I think of it in terms of sin almost. If you are going to be a Christian and you said, “Oh I never sinned. I am perfect I am a saint,” well, see, that’s us Lutherans, and I know that this was also in the Catholic Church at one point: we see ourselves as being both sinners and saints at the same time, fully sinful, and we have our saints leading us through Jesus, and it’s not something we can claim as a work of our own, that we have been able to do. But we will talk about being liberated by Christ, to do good works on behalf of other people out of thanksgiving for what Jesus has done for us, and there really is something to that. I was an atheist for many years, and I got drawn in to the Lutheran Church because there was a piano, I play piano, in my neighborhood that I was living in New York there was a piano that they let me practice. I just started coming as a member, well not a member–I wasn’t even really looking for a church. And, I later found out that I really was Lutheran, and that this idea of having a Christian denomination that accepts the fact that you are a sinner, but doesn’t beat you over the head with it, or doesn’t seek to– well of course there is Lutheran guilt along with every other kind of guilt. I don’t know if it’s all that different from Jewish guilt or Catholic guilt. eNews Park Forest: I don’t think so. This is the first in a periodic series of interviews eNews Park Forest has planned with local pastors, rabbis, and imams.